Terrascapes has been undertaking all aspects of landscape construction since 2003. We can offer patios and paving, driveways, decking, fencing, turfing, ponds, walls, structures and planting. These services are offered across all sectors including residential, light industrial, commercial and office premises, parks, residential homes, housing developments and hotel and leisure facilities. Whether you want a simple lawn or a complex decking or a paved area, Terrascapes is able to offer a landscaping service to meet your needs. We can have your garden designed from scratch, help you with planning, or work to existing plans. All of these can be considered in an initial free consultation. We work closely with designers and clients to create the perfect outside space. We can supply and install a vast range of paving whether it is reconstituted/concrete slabs or natural paving. We are able to offer any type of drive that you require including gravel, block paving, tarmac or resin bound surfaces. Whether as a boundary, for privacy or for safety most gardens have some sort of fencing. We can build timber or metal fencing in a variety of designs to meet your needs. If your garden is on a slope then the most cost-effective way to create a level area is to build a deck. 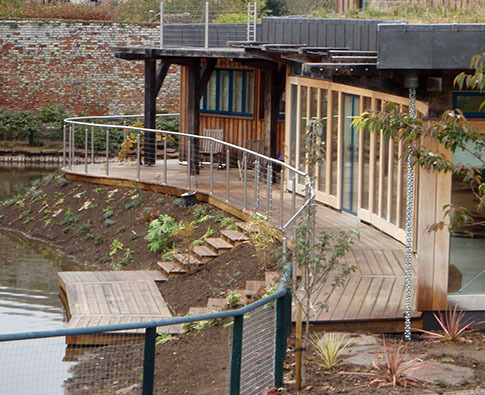 This can be done using treated softwood, hardwood or composite boards. It can also be finished off with a timber or metal handrail to ensure that it is a safe area to use. If you need a lawn replacing or a new lawn laid then we can undertake this. We install a range of different quality lawn turf or prepare and seed areas as required. We can undertake the construction of boundary walls and retaining walls whether finished in block, render, brick or timber. We source good quality plants, shrubs, hedging and trees and can follow an existing design or advise if preferred.